Scout’s Preview: Can Bills Stop Saints Explosive Offense? We will all find out the answer Sunday at New Era Field when the Bills host the explosive New Orleans Saints. The Saints are 6-2 on the season, have won six in a row and are alone at the top of the tough NFC South. Not only are they in first place, but during their win streak, they are averaging 30 points per game. This is probably the best offense the Bills will face all year. The Saints offense is designed and run by Head Coach Sean Payton, who is one of the best offensive minds in football. He knows how to systematically take apart any defense. Every play that Payton runs early in a game is a setup for another play later on. He knows how to exploit a defense’s weaknesses with a combination of the pass and run. The key reason Payton has so much success on offense is the guy he has playing under center. Drew Brees may be 38 years old but he still is at the top of his game. While he lacks ideal size at barely 6’0, he is one of the best at reading defenses and has one of the quickest releases in football. On top of the quick release his accuracy is deadly. For the season he has completed 71.6% of his throws and has thrown 13 touchdown passes. One of the reasons Brees is so good is he has an excellent receiving corps to work with and that includes his running backs. They’ve accounted for 68 receptions already. The Saints leading receiver is second year man Michael Thomas, who already has 50 receptions. Speedy Ted Ginn Jr is having an excellent year with 28 catches, and Brandon Coleman has 14. Coby Fleener is the tight end. While he isn’t a top blocker he is a very reliable receiver. After the trade of Adrian Peterson a few weeks ago, veteran Mark Ingram has come on. He has 541 yards rushing and another 31 receptions. Rookie Alvin Kamara is more of a situational ball carrier, but he is a key part of the passing attack with 38 receptions. While he isn’t the biggest guy, he has exceptional speed and quickness and is very elusive. The Saints line is big a physical. This week they get back guard Larry Warford who is excellent at both run and pass blocking. Left tackle Terron Armstead is a Pro Bowl caliber player and rookie Ryan Ramczyk look to be a future star. The biggest change on the defense is the addition of two excellent coaches. Former San Diego Charger Head Coach Dennis Allen is the defensive coordinator and the linebacker coach is Mike Nolan, who is a 35 year coaching vet. He has been a Head Coach or a coordinator for a long time and has a vast knowledge of defensive football. 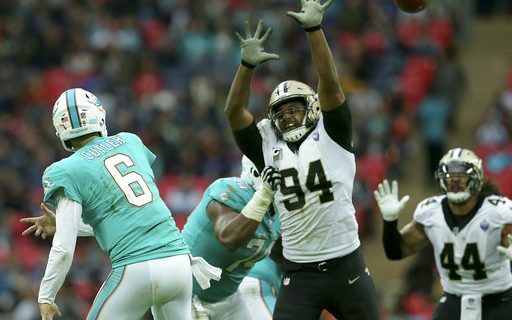 The star of the defensive line is defensive end Cameron Jordan who already has 7 sacks on the year. The linebacker corps isn’t big by NFL standards, but they have speed and can play in space. The whole group can defend both the run and pass. In the secondary is one of the best rookie corners in the league. First round pick Marshon Lattimore looks like a future Pro Bowler and as adapt and can both cover and defend the run. Safety Kenny Vaccaro is excellent. Last week the Bills defense gave up both yards and points. They’re going to have to revert back to their early season form to stop the Saints. Getting E.J. Gaines back will help in the secondary. What helps the Bills as well is Head Coach Sean McDermott has a lot of experience in defensing Sean Payton and the Saints. So the Bills should be ready. What will be interesting on offense is to see how newly acquired Kelvin Benjamin fits in. He should get his first start and between Benjamin, Jordan Matthews and Zay Jones, the Bills have some real size at the wide receiver position. That should provide some matchup problems for the Saints. Also tight end Charles Clay could be back and with him being Tyrod Taylor’s favorite target, the Bills passing offense could be drastically different this week. It will be interesting to see how it plays out. Right now this looks like it could be a high scoring game. The only thing that may slow that down is the weather but the Sunday forecast looks to be a typical November afternoon in Orchard Park…partly sunny and 43 degrees. For more of Greg’s insights into the NFL, visit his author’s section at Buffalo Sports Page.